Just Say Yes to Pot(s) (of Black Tea)! The findings about tea – like the findings about pretty much everything we eat or drink these days – are controversial. From articles like this one, that claim black tea can practically work health miracles, to this article, which suggests that tea has more drawbacks than benefits, the information swings from one side to the other. I suspect that the truth is somewhere in the middle, as this article indicates. Recent studies link black tea to lowered risk of Type II diabetes, and advise that it can help lower your blood pressure – though it is unwise to use 150 teabags per day for 20 years. (No kidding.) But even if all it did was taste good and hydrate your tissues (yes it does), it would still be worth drinking. Be that as it may, tea is delicious; and since black tea is my favourite, that’s what I’m writing about. And… say, this is a blog, isn’t it? So that means I can combine this article with a rant about one of my pet peeves! Hurray! Nobody in any restaurant in Canada seems able to make a Good cup of black tea! Passable, yes… occasionally even not too bad. But a good cup of tea? Nah. Mostly it’s a sad little tea bag, filled with tea-dust and dipped in coffee-machine water that’s not even close to boiling. Or worse, a sad little tea bag filled with tea-dust and placed in a styrofoam cup, which is then filled with cold water and put in a microwave. It comes out with scum on top. Toxic scum. It’s disgusting! Disgusting, I tell you!! So, here’s how to make a good cup of black tea at home. And you should do so on a regular basis, for your health – and because it’s tasty. If all you’ve had before is restaurant tea, and you haven’t liked it much, making a good cup of tea at home might just change your mind. Start with a teapot. It’s better than way. 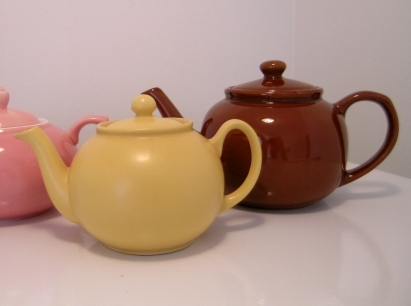 Use a ceramic teapot like the ones in the picture, not a metal one. You can use a glass one if you must, but a ceramic one makes a better-tasting cup of black tea. Next, put the kettle on. You can’t make good black tea unless the water is boiling. Really boiling. 100 degrees Celsius, 212 Fahrenheit. Seriously. I mean it. While the kettle is heating up, rinse out the pot with hot water a couple of times to heat it. I used to think this didn’t made much difference, but I’ve changed my mind. It does. Now, the tea. Don’t use the sad little teabags, my friend. Even expensive tea bags don’t contain first quality tea – they never do. First quality tea is sold loose, and it does cost more than those sad little bags of tenth-quality tea-dust. That’s because real loose tea is much better. 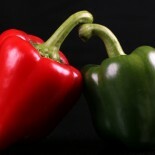 Flavour, aroma, freshness… so often these things are tied not only to enjoyment, but to nutrition. How much tea should you use? That depends. The standard amount is “one teaspoon per cup, and one more for the pot”, but personally I think endless variation on this suggestion is possible. It depends on your taste. I like to use less tea and steep it longer. But I also like my tea stronger than some of my friends, because I take it with Hypocritical Milk. I’d say, start with the standard recommendation, see if you like it, and adjust accordingly with your next pot of tea. You can add the tea leaves to the pot as they are, or use a tea-ball or mesh tea strainer to make cleanup easier. Try it both ways, to see whether it makes a difference for you in the taste. When the kettle is really boiling – roaring (or whistling) with lots of steam rushing out – pour the boiling water over the tea leaves and fill the pot. If you have the choice, bring the pot to the kettle, rather than the kettle to the pot, so that the water will be as close as possible to the boiling point. Next, put the lid on the pot, and let the tea steep 3 to 5 minutes, according to what you find your taste to be. Now it’s ready to drink – as is, or with milk, honey, agave nectar (which gives it an additional toffee-like flavour), or sugar if you must. Drink, enjoy, and repeat as necessary. Thanks! And I just read your post about returning to India from Australia and thought it was great! This entry was posted on March 22, 2013 by thinkreadcook and tagged beverages, black tea, blood pressure, diabetes, drinks, food, health, nutrition, tea, teapot.